Wall Street Journal bestselling author Charlie N. Holmberg returns to the enchanting world of The Paper Magician. Alvie Brechenmacher has arrived in London to begin her training in Polymaking—the magical discipline of bespelling plastic. Polymaking is the newest form of magic, and in a field where there is so much left to learn, every Polymaker dreams of making the next big discovery. Even though she is only an apprentice, Alvie is an inventor at heart, and she is determined to make as many discoveries—in as short a time frame—as she can. Luckily for her, she’s studying under the world-renowned magician Marion Praff, who is just as dedicated as Alvie is. Alvie’s enthusiasm reinvigorates her mentor’s work, and together they create a device that could forever change Polymaking—and the world. But when a rival learns of their plans, he conspires to steal their invention and take the credit for it himself. Charlie N. Holmberg is the author of Smoke and Summons, Siege and Sacrifice, and Myths and Mortals in The Numina Series. 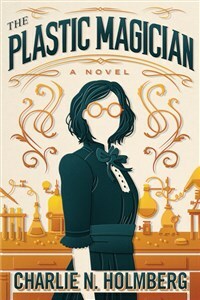 Her Wall Street Journal bestselling Paper Magician Series, which includes The Paper Magician, The Glass Magician, and The Master Magician, has been optioned by the Walt Disney Company. Charlie’s stand-alone novel, Followed by Frost, was nominated for a 2016 RITA Award for Best Young Adult Romance. Born in Salt Lake City, Charlie was raised a Trekkie alongside three sisters who also have boy names. She is a proud BYU alumna, plays the ukulele, owns too many pairs of glasses, and finally adopted a dog. She currently lives with her family in Utah. Visit her at www.charlienholmberg.com.